Ashley Cole has explained away Chelsea’s recent blip by looking to the big players the team have been without. Chelsea Dance: Happy Christmas From Terry, Lamps & Co.
TCB has teamed up with 101 Great Goals to create a regularly updated video feed which will be of interest to Chelsea fans. From the latest goals on a match day to interviews with the players and manager, TCB videos provides all blues with their extra Chelsea fix. If you asked any Chelsea fan to handpick their opponents in the last 16 of the Champions League they will have probably chosen Danish side FC Copenhagen. After all, other potential opponents included the likes of AC Milan, Roma and Lyon. Carlo Ancelotti has offered some encouragement to Didier Drogba by confirming if our striker is fit, we stand a better chance of beating Arsenal at the Emirates. 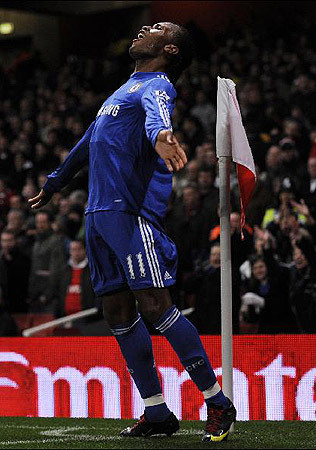 Drogba has scored 13 goals in 13 games against Arsenal, with us winning the last 5 games against them. Has Manchester United Fixture Change Worked To Our Advantage? It was revealed yesterday that our postponed fixture against Manchester United will now be played on March 1st. This should allow for the likes of Frank Lampard and Jose Bosingwa to be match fit, as well as the possibility of any new signings Carlo Ancelotti may introduce in January. Filed under: Random | Comments Off on Has Manchester United Fixture Change Worked To Our Advantage?